Size: 7.9 inches Color: Elegant butterfly art design, unlimited memories, happy life, creating a high-quality ceramic vase. Each of them is an artistic ANDING ceramic vase product, a high-quality white porcelain made by ceramic perfectionists. This pure white butterfly vase is carefully carved, sturdy and durable, not easily deformed and lasting in quality. The simple and modern design comes from the heart of the ceramic engineer. The best pure white modern vase. Perfect home decor, wedding center or vase gift. 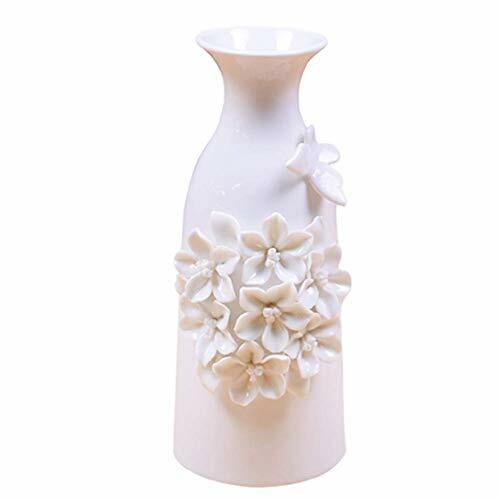 Quality Materials: 100% premium white porcelain and high quality original products Unlike the cheapest plastic or low quality wooden vases on the market, this textured ceramic vase is made from our most famous ceramic center - high quality white porcelain. China Jingdezhen produces and exports 90% of high-quality ceramic products from around the world. ANDING ceramic products are the best materials and ceramic firing technology. Hand-made simple white modern vases, each pure white florets and butterflies are hand-crafted and then carefully packed and shipped directly to Amazon's warehouse and our customers. Due to the manual work, each unique texture pattern is slightly different on its surface. If you are not 100% satisfied, then the money is to ensure that the ANDING brand product development team is committed to the most effective cost structure to provide the market with quality products. Customer satisfaction is our top priority. If you are not satisfied with our products, please send us an email and we will give you a full refund. When customers like it, we will only bring the product to market. Great for adding a decorative touch to any room's decor. Wonderful accent piece for coffee tables or side tables. Perfect for everyday use, wedding, events, aromatherapy,Spa, Reiki, Meditation. BENEFITS: The vases can accent your home or office for the right decor with or without dry floral or greenery additions. If you have any questions about this product by Anding, contact us by completing and submitting the form below. If you are looking for a specif part number, please include it with your message.